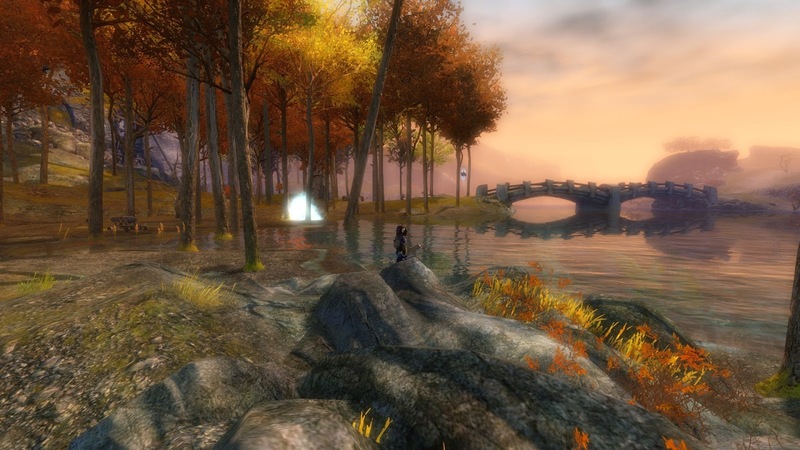 Tobold wrote a squib recently, entitled "Anyone Remember Aion? ", in which he observed that Aion "is now making 7 times as much money for NCSoft than the subscription game Wildstar". He was making a point about payment models but the more interesting part to me is the subtext, which is this: there are a lot of MMOs out there and the great majority of them just keep on going even though none of us here is paying them much, or any, attention. Azuriel, whose original post inspired Tobold's, went on to make the point overtly: "MMOs shutting down is more rare than you think.". It really is. What's more, new ones start up all the time. It's true that there's a subculture of relatively short-lived pure F2P titles from the East (although even there we're still talking about games that hang around for several years) but for every one that disappears another seems to pop up to take its place, and when it comes to games from developers based in North America and Europe, the odds seem to favor longevity. MassivelyOP was buzzing with news stories along these lines all week. Age of Conan, the very example Azuriel gives of an MMO that no-one ever even mentions any more, crops up with a story about a new raid. Tera developer Bluehole posted pictures from a secret project that may or may not be a new MMO. (Pro Tip - if you want to keep your project secret, don't send out press releases about it) Trion have something going on that they really are trying to keep to themselves but the dataminers and patent-watchers ferreted it out. On and on it goes; the ever turning MMO wheel. Reports of the genre's death seem much exaggerated as do speculations over the supposedly inevitable demise of WildStar. The top story this week was undoubtedly Carbine's (or most likely NCSoft's) decision to make WildStar Free to Play. You could say it's the move we've all been expecting but actually I think a lot of people, myself included, were banking on Buy to Play, which is something significantly different. Of course there are always nuances. Although Carbine are making a big deal of the "Really Free" aspect, their payment model would more properly be called a Hybrid. The full F2P model necessarily relies on cash shop sales alone but Carbine have concocted a convoluted version that includes both Loyalty points and a quasi-subscription "Signature program", whose perks look decidedly underwhelming to me. I was reluctant even to bother with the beta for WildStar but to my surprise when I gave it a go just before launch I found I rather liked it. Obviously not enough to pay to play it or, well, I'd be playing it, but it seemed to be something I'd most likely enjoy dabbling with here and there, now and again. That's almost certainly what will happen this autumn when the pay wall comes down. We're off on holiday next week but when we come back I think I'll buy two copies, just in case Mrs Bhagpuss wants to take a look as well, mostly to have access to 12 character slots instead of just two. 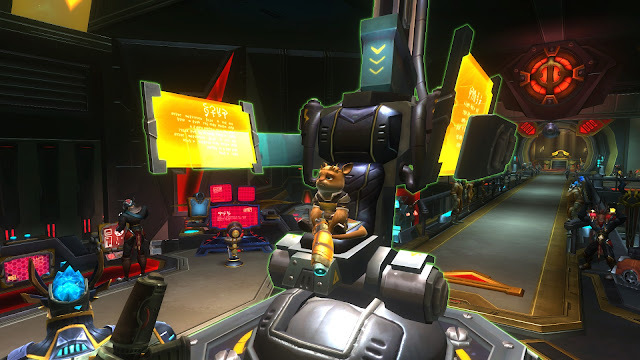 Am I likely to make a dozen characters in WildStar, ever? I doubt it but I like owning MMO boxes; they look good on my bookshelves, so why not? Hey, shopping and gaming - it's a thing, right? And it's cheap on Amazon right now. We'll see how long that lasts. Another MMO I like and don't play (okay, that's a long list...) is Ryzom and that turned up in the news this week as well. It's a game that's had a turbulent history. It was one of the earlier entries in the genre, beginning development more than a decade and a half ago and passing through the hands of three owners in three different countries (France, Germany and Cyprus) before eventually going Open Source in 2010. Since then it's been one of the myriad of forgotten MMORPGs that chug along in the background, played and loved by, at most, a few thousand players. I played the original beta long, long ago and I've been back a few times. It's a very interesting MMO with an unusual setting, stylish and stylized graphics that have stood up well over time and gameplay that can be compelling. It's also fiendish hard in some ways, at least by modern standards. It's not a game you expect to see pop up in news reports so it came as a complete surprise to read this MassivelyOP piece saying Ryzom was up for a Steam Greenlight. Had, in fact, already been approved. That's probably not going to get me to play again, although it's a game I feel I could always go back to at some point. All the same, it's great to see one of these older games not only still plugging along but potentially even growing and finding a new audience. 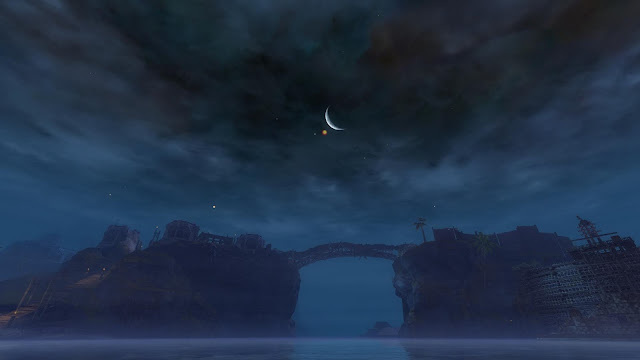 One more MMORPG that's had a checkered history without ever even coming to market is Otherland, a property based on the series of Tad Williams novels. MassivelyOP (Yes, them again. What would we do without them?) reports that development is still ongoing under the new owners. The game's in some kind of closed beta, for which I believe I signed up, only I have no idea what email address I used. Obviously not one I check very often. I should do something about that. It would be good to get a hands-on some time. I really enjoyed the source material and I've been following development, if fitfully, ever since the game was announced. Whether it will ever see the light of day I wouldn't like to bet but at least something's still happening. I could go on. I could mention Wander, the non-combat, exploration MMO. That looks intriguing. It's inconveniently launching on the very day we go away, though, so perhaps I'll leave it until we get back. 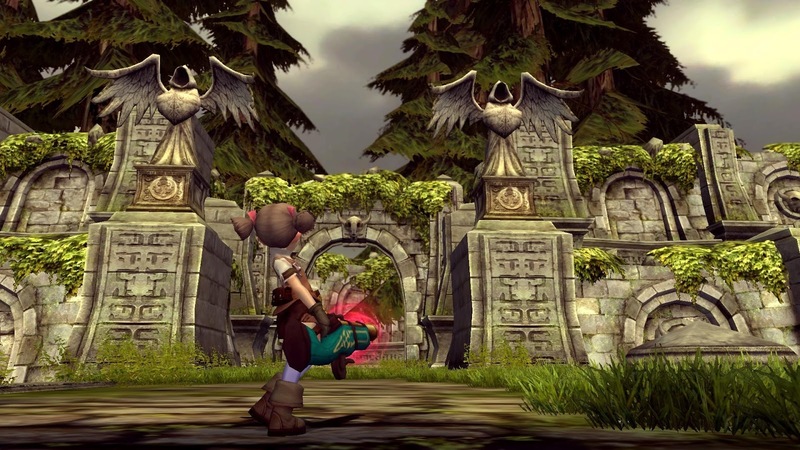 Or perhaps Dragon Nest II which very confusingly appears to be four different games. I'd better save that for after I'm done with Dragon Nest: Oracle, which isn't going to be any time soon, or at least it won't be if they'd be so good as to fix the darn portal bug! Ahem. There's even a rumor the GW2 expansion might come out this side of Christmas although I'm taking that one with a large pinch of salt. And to think, some people said it was going to be a quiet year! This week I found myself in the annoying position of having a lot to say and very little time to say it. There was nowhere near enough time to play and blog as much as I wanted to, and in the end I cut the short end off blogging to get a few more hours on Ragefire. As others have commented, the ability of Everquest to sink its claws in and hold on remains undiminished after all these years. Tobold is right to imagine this won't go on forever and with the experience of Fippy Darkpaw behind them, Daybreak Games clearly would have preferred not to open a second server, but the continuing popularity and concomitant pressure on Ragefire meant they were unable to hold that line. Lockjaw inc! I'm staying where I am. Unlike Stargrace I've had no real trouble finding plenty of stuff to kill in the ultra-low level starting areas and I haven't even tried to use the /pick command to swap instances to avoid the crowds. I pottered around my gnomish homeland for a while until I hit level three and then, with a vague plan to get to Qeynos, where the hunting is pleasingly gnoll-based and the scenery is more authentically 1999, I meandered my way out of Steamfont, along the high zone wall of Lesser Faydark then along the paths of Greater Fay until I reached the Butcherblock Mountains. That all went without mishap and I was probably overconfident in taking a shortcut straight through the Butcherblocks to the docks, what with just about everything conning red and the dwarven guards viewing me as criminal scum. Overconfident, yes, but I got away with it, largely due to everything being camped to beyond an inch of its life. 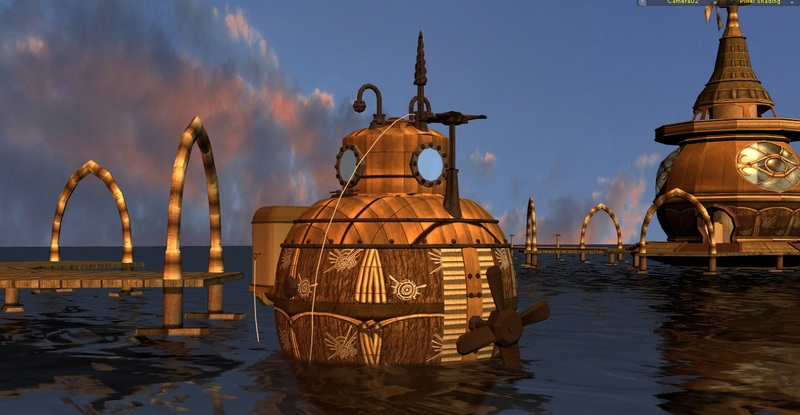 I was more cautious at the dock, swimming (excruciatingly slowly) around the barrier walls and conning the dwarf fishing by the pilings, who glared at me threateningly but declined to swat me as I edged past him on the very edge of the wooden boardwalk. Too near the edge as it happened - I was so nervous of getting too close to him that I fell off the jetty into the water and narrowly avoided being devoured by a scowling aqua goblin as it emerged from the sea. That was about as dangerous as the entire trip to Qeynos got. There's nothing facilitates safe travel so well as a full server - nearly every danger along the way was either dead or fast on the way to it as hordes of groups camped every tasty pull spot while every class that could solo roamed the paths and thickets in search of prey. The addition of Soulbinder NPCs in all starting cities and a number of other useful locations offered valuable insurance against time lost and I was very glad to take it but in the end I didn't run into any trouble at all. Pretty sure this used to be the LDON questgivers' camp. Nice of her to arrive six expansions early. Outside Qeynos itself I ummed and ahhed for a while, trying to remember if gnome necromancers are kill on sight to anyone there, a significant factor when you're bound in The Arena off Lake Rathetear and the Qeynos Soulbinder you need to speak to to save you a half-hour run back is deep inside the city, right next to the bank. I tried Google but the results were inconclusive. In the end I decided to chance it and once again my luck held. The entire journey took around three hours but I did take a goodly amount of time out to jump on any unsuspecting creature I thought wouldn't give me much of a fight along the way. I killed frogloks and alligators in Innothule Swamp and jungle spiderlings and lizardmen in The Feerrrott. 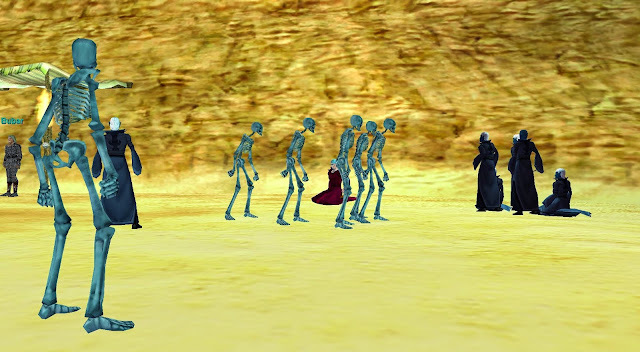 Once I got to Rathe Mountains, though, I saw the deep, deep red giant skeletons stomping around, pulled my running boots on (metaphorically speaking of course - no JBoots for me - didn't even see Hasten), put my head down and ran. Swimming across Lake Rathetear was painful and trotting through South Karana nerve-wracking but the run across West Karana was just long. I always used to believe it was a flat fifteen minutes from one side of West Karana to the other without the benefit of SoW or Selo's. For the first time in the entire sixteen years, when I could have done it but never did, I had the presence of mind to time the run. It turns out that from the South Karana bridge to the Qeynos Hills zone line is ten minutes on the button. Add in the extra distance from East Karana and I think that fifteen minute ball-park figure comes pretty close. That's some hike. 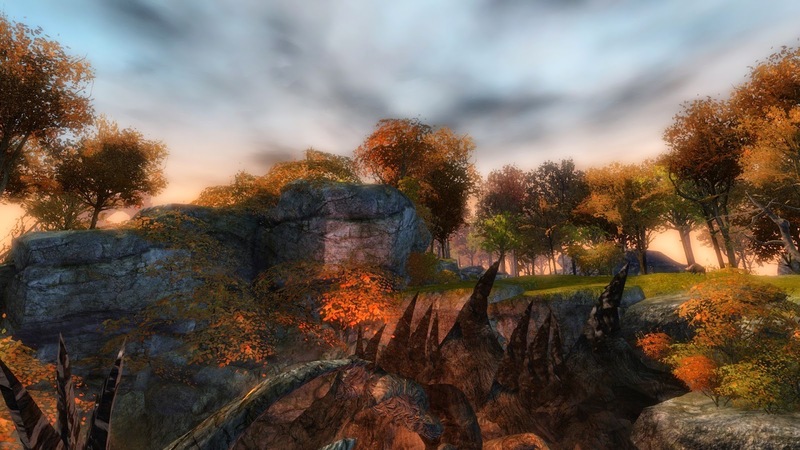 How many modern MMOs have zones that take 12-15 minutes to cross in a straight line? As I jogged towards the finish I took a long, hard look at Brother Trintle as he strolled around just outside the barbarian fishing village in West Karana. I was trying to remember if he was a good priest or a bad. Trintle was an even con at Level 5, which I'd dinged on the way, having stayed in Freeport until I hit Level 4 so I could get my spells and my lovely new yellow-con pet. I knew he had some kind of a drop and I was 95% sure he was a wrong'un. He was so very tempting but in the end caution prevailed. Didn't want to blot my copybook with the Qeynosians even before I arrived if it turned out he was the good priest after all. Didn't want to have to run all the way back from The Arena if it turned out he was an overcon. 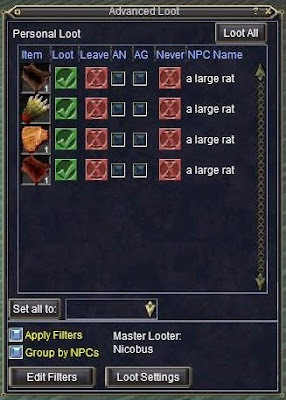 These are the kind of decisions you have to make all the time in Everquest. It's a thinking player's game and a gambler's, too. I'll be back, Paw. One day. Mark my words. But for now I'll just go the long way round. Safely bound outside the Qeynos bank and with no-one actively trying to rip my head off I just had half an hour to go gnoll-hunting. 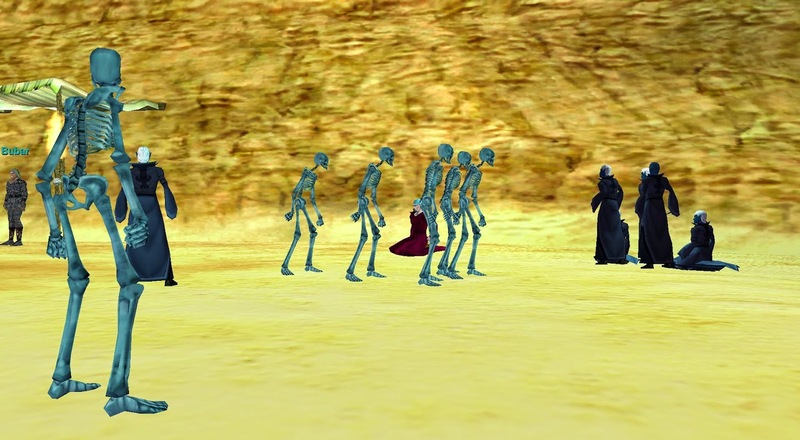 Blackburrow was predictably camped to Sunday and back but I found a good number of scouts and watchers in Qeynos Hills whose short and unhappy introduction to my bony pet made the first inroads into improving my standing with the residents of the Karanas and the Qeynos Guard. It was all going so well. And then Holly Windstalker came up out of nowhere and started yelling, as she does. I was nowhere near any of her precious wild animals either! Apparently she has no truck with gnomes or necros or both. Okay, it's necros. I knew that, really, or rather I worked it out as I sprinted for the West Karana zone line, while my noble pet gave up his unlife to act as a speed bump. I would have made it, too, if the bloody woman hadn't rooted me. Respawning at the bank I called it a night. At least I know to keep an eye out for her in future. And since she hates me anyway her bears and wolves are fair game from now on. That was where I left it. Haven't had a chance to get back on since due to the aforementioned time pressures. There's no rush though. Mrs Bhagpuss and I are off on our travels again soon but I have a few free days before and after and anyway those gnolls are aren't going anywhere. 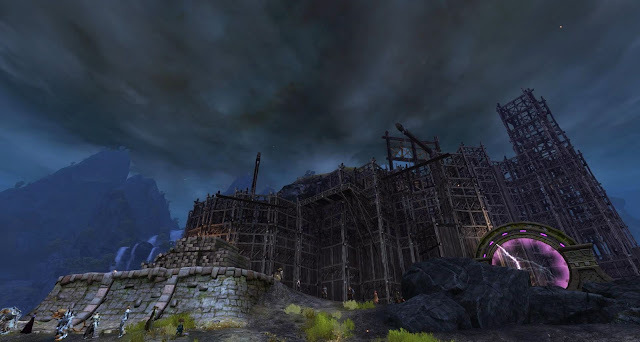 Playing on Ragefire these past couple of days has reaffirmed an uncomfortable truth: for me, after more than a decade-and-a-half and well over one hundred MMORPGs, nothing the genre can offer has ever surpassed the effortless, natural pleasure of starting a new character on a new server. To step out into an unforgiving world with little more than the clothes you stand up in and an empty backpack waiting to be filled, well it's the pure essence of what drew me in all those years ago and held me ever since. In creating the concept of the Progression Server SOE and now Daybreak Games have had to make many necessary compromises. 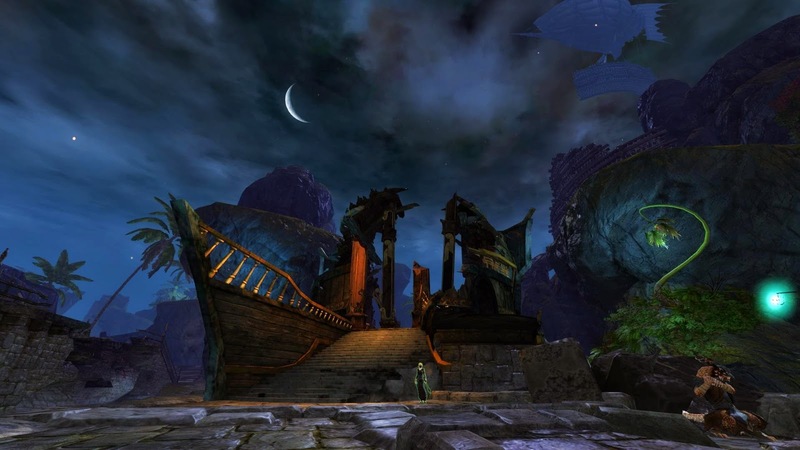 A list of all the ways the current systems differ from any of the variations that existed during the twelve or so months between the April 1999 launch and the arrival of the first expansion, Ruins of Kunark, would fill this blog post several times over. Every single one of those changes has made the game "easier" than it used to be. And yet it's still not easy. Not easy at all. 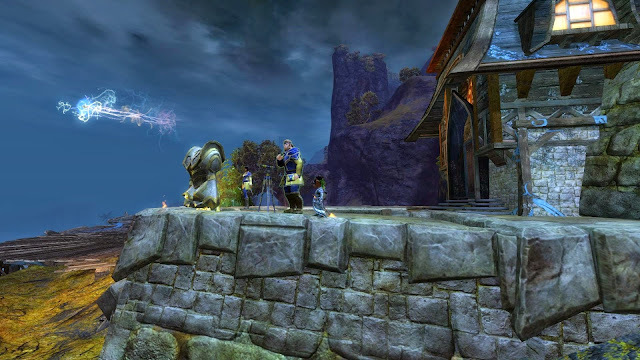 Aywren asked in yesterday's comments for advice and information on the appropriateness and practicalities of soloing under the new ruleset and I replied that I have always believed EQ to be a very solo-friendly MMO, which I have. It occurred to me today, though, how very much that solo-friendliness depends on experience and knowledge. Much, much more so than any MMO that I've played, or at least any that was released in the last ten years or so. Six-boxing means never having to ask for help. Which is just as well because everyone hates you. As you join Ragefire, your character is inserted automatically into a number of custom chat channels. Yesterday I found myself listening to chatter from characters in my level range, my class, my geographical location and more. Everyone was asking questions. Where do I go? Who do I speak to? What level do I need to be? These are the kind of questions you expect to hear in any new MMO but they mask a deeper concern: how do I survive here, let alone prosper? How do I even get started? For example, where are the quests? 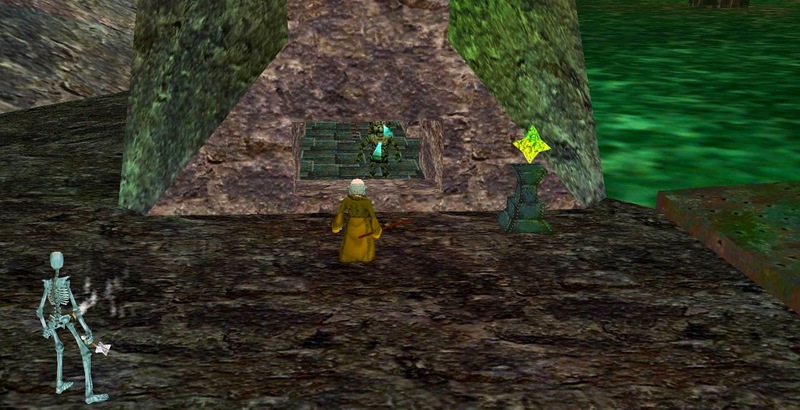 Famously and perhaps surprisingly in a game that has the word in its very name, Everquest does not use quests as a framework for gameplay. There are quests of course, many hundreds of them in the classic game alone, but there is nothing to tell you where they are, how to find them, how to proceed if you do or what you might get if you succeed. There are no exclamation points, feathers of flags above the head of any NPC. There are no tidily arranged "hubs" marking a breadcrumb trail across the zone. 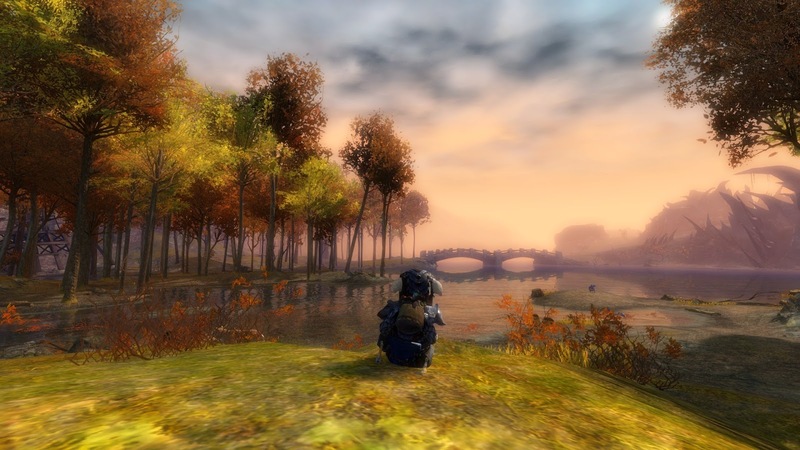 Players aren't used any longer to being cast so adrift, especially right at the beginning of their journey. Worse still for many, at no point do you ever find out if you are "done" with an area, whether it's time to move on, or if it would profit you to stay a little longer. It's not even something you can tell easily by looking at anything as basic and fundamental in most MMOs as the level of the mobs around you. In Classic the scope of opportunity in most zones can span almost the entire level range of the game. This morning in North Ro, where my Level 3 necromancer was happily hunting Level 2 aardvarks and decaying skeletons, someone trained a Crypt Mummy to the nearby inn. The mummy was somewhere in the mid-teens, capable of killing my necro in a couple of blows. It hung around the doorway for a while, preventing anyone from using the facilities (which didn't bother my necro, who had already been told he was persona non grata there due to his filthy proclivities). A little while later, further out on the sand hunting Level 3 Young Pumas, he saw a Sand Giant serving up rough justice as it wiped out a group a few levels higher than him as they camped the very same camp of undead from which the mummy had been trained. In Norrath everyone is very much in it together, for good or for ill. The Hill Giants and Griffins that send you running for cover as they wander by are the prey of other players whose level you one day aspire to reach. Everyone is on their honor to look out for everyone else and the example of the reward for hard work and determination is always there before you: power, freedom of action, revenge, wealth. You cannot help but be aware of the danger posed by creatures outside of your level range but unlike other games you equally cannot be quite certain what is and is not within your capacity to handle. Mobs do have exact levels but that information is concealed at all times. You are merely permitted to see a range of colors and descriptions that encode vital information, which you must learn to decode by trial and experience. Before you attack anything - or even if you intend to run past it - you should target and "consider" it to assess the risk. Only at this point do you learn whether your target is higher or lower than your own level, something you have to derive from the color of the text. Only if it matches your level exactly will you be certain - mobs of your precise level have their information in White. Below you comes grey, green, light blue and dark blue and above you comes yellow and red. That helps but not as much as you might imagine. Each color encompasses a level range that is itself variable according to your own level, something that really matters a great deal when considering things that are more powerful than you. 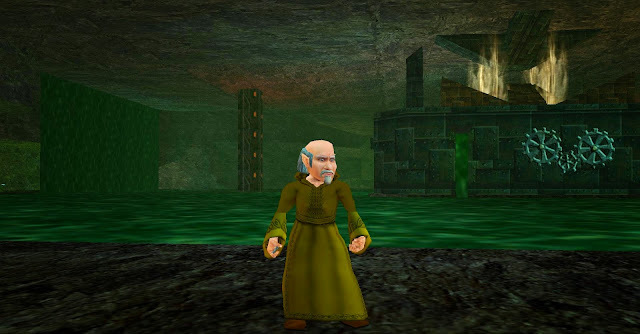 In Everquest levels mean a lot but then so do many other factors and many of those are invisible. It's true that you can tell the attitude of every creature from its description but its easy to forget as an experienced player that the hard information comes with a figurative wrapper. Before you can make a full risk assessment you have first to be able to parse the descriptive language for meaning. An animal that "scowls" at you will attack , unprovoked, from its maximum agro range while one that "glares" will let you pass by unharmed unless you almost trip over it, whereupon it will turn and fight. 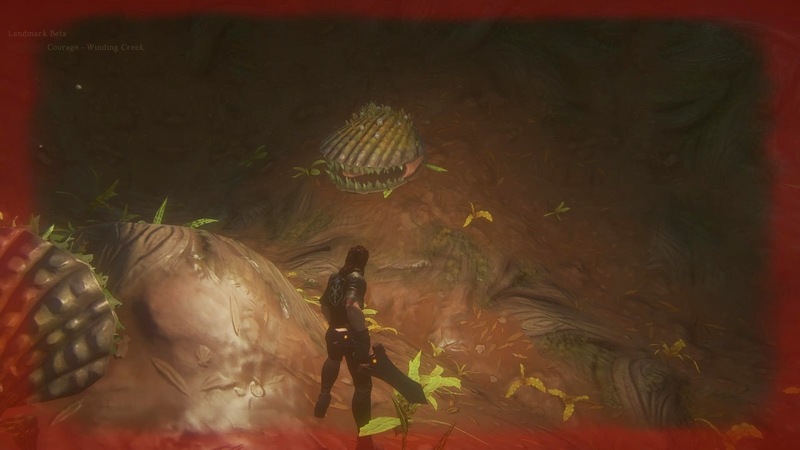 A "dubious" creature will only attack if you attack it first. Let's not even start on which creatures are worth killing. worth almost 2 gold each though. Which would be all very well if you could see the aggro range somehow. You can't. Or if the aggro range was constant. It's not. Or if every creature of the same level was of comparable difficulty. They aren't. Over time and with experience you will come to know without having to check, for each kind of creature you encounter, in a particular zone that you feel you now know well, what will or won't attack, how close you can approach before something unpleasant is likely to happen and how likely you are to survive the experience. When you get to that point you may feel you're really beginning to make progress but there's so much more to learn before you can begin to think of yourself as a seasoned professional adventurer. For one thing, there's the matter of faction. There are visible factions you can see and measure and affect. 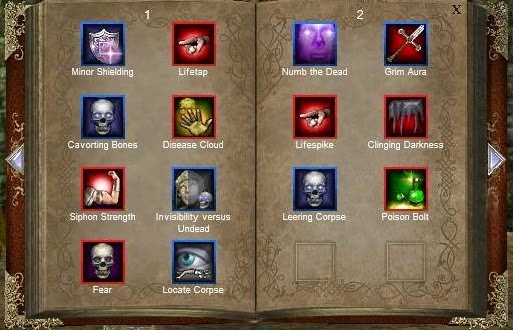 Each time you kill a gnoll you'll be given a list of all the groups in Norrath who approve or disapprove and a numerical value for how much more they like you now because of your gnoll-killing ways or, conversely, find you increasingly detestable for picking on poor innocent gnolls (it's mostly gnolls who feel that way and who cares what they think?). You can and probably should make concerted efforts to curry favor with certain groups, not least because it may stop some guards, who you might have imagined were placed there to help and protect the characters of paying customers like you, from instead attacking and killing your character on sight. Norrath is a world that seethes with intrigue from the pettiest official to the mightiest cabal. You can get on the right side of some of them but there's always someone on the wrong side of you. There are NPCs who will kill you for the class you chose or your race; they will kill you because you cast an illusion or because you killed someone they like, even though you had no idea they even knew each other. Even animals have their alliances. I had completely forgotten that Fire Beetles in the Deserts of Ro consider all beetles to be their kin and come racing to the assistance of Scarabs. At least those two look alike. Often creatures that are normally disinterested, like Decaying Skeletons, will become hostile if they notice you attacking one of their ilk but sometimes creatures that seem to have nothing in common at all will leap to each other's defense. There's literally no way, in game, to know what social ties underpin Norrath's wildlife other than by observing and remembering each encounter. I could go on and on and on but the the detail doesn't really matter. It's understanding the level of complexity involved that's the key to survival when you set out to solo your way across Norrath. Compared to any modern MMO you care to name Everquest, even now in its much-simplified and ever-increasingly user-friendly form, offers a ferocious learning curve. It's all very well for me to claim blithely that anyone can and should jump in and solo away but I really ought to remember that it took me months of playing 20-40 hours a week just to get to the stage where I could comfortably and confidently run a character from one end of a zone to the other and expect to get there alive. So, yes, if you haven't played for a while or ever, do give it a try. 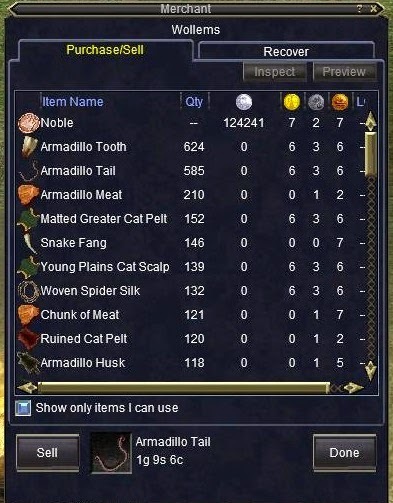 I firmly believe that beginning a new character afresh on a new server remains the most compelling experience MMORPGs have to offer and Everquest retains all its magnificent potency. Just don't expect it to be easy. Or painless. Or quick. It's like learning a language. You can pick up enough to get by in quite a short time but proficiency takes years. I'm nowhere near fluent yet but I'll keep trying. 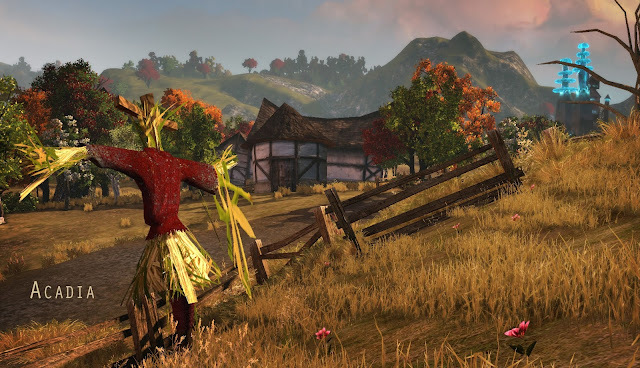 After a turbulent first couple of days, worthy of any full MMO launch, it seemed that Daybreak Games finally have all their orc pawns in a row. Ragefire, the new Voting/Timelocked Progression server (catchy...) is up, stable and devoid of Level 50s, although scuttlebutt has it there was a six-boxer already pushing Level 35 last night. As of this morning they even have a system up and running for handling log in queues and kicking AFKers. With a couple of hours to go before bed, after finishing up my dailies in GW2, I thought I'd give it a try and see if I could make a character. It was still mid-afternoon on the US West Coast so maybe there was a chance I'd get in. And get in I did. At first I got the expected Server Full message but going with the launch-time vibe I kept on clicking and to my considerable surprise it took just a couple of minutes until there I was at Character Select. In the last round of Progression, on the Fippy Darkpaw server, I went with a gnome necromancer. In the end, this time, I chose to do the same. I did toy briefly with the idea of going Magician but, while my highest level EQ character is a Mage and the class is arguably the most powerful solo specialist at the top end, I've always found the low level gameplay a little disjointed and frustrating. I also rather fancied being a Dwarf for a change but one look at the Classic options for Dwarves (Cleric, Warrior, Rogue, Paladin) quickly put a stop to that plan. So, Necromancer it is. That makes my fifth in sixteen years. All gnomes. It's a class I have played and enjoyed a lot and yet with which I've never really made much headway. Over the years I've played alongside some extremely skilled and versatile Necromancers, not least Mrs Bhagpuss, who used to main one for a while, insofar as either of us ever "main" anything. A well-played necro can pretty much fill in for every role in the game. They, not Bards, are the real all-rounders of Norrath. The trouble is, knowing how good they can be is quite intimidating, especially since a lot of them...aren't. You really don't want to be That Necro. There's a lot to take in if you want to give full service to a group as a Necromancer and I can't see myself putting in the hours. It's never to late learn, as Jeromai rightly observes, but I fear it would end up being a project almost on the scale of his latest venture and I don't think I'm ready to commit to that. Apart from my Heroic Level 90, who has never adventured further than Plane of Knowledge, the highest I've ever taken a necro is somewhere in the 40s. It's extremely unlikely that this latest addition to Bertoxxulous's Dark Army will get even that far. Indeed, odds are very good that he'll get no further than his Progression server predecessor, who topped out around Level 12. At least I think he did. 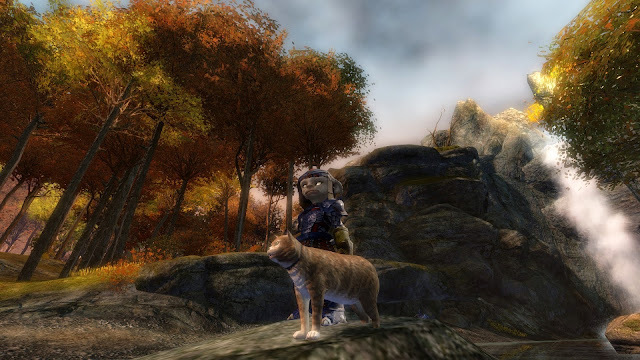 I can't check because, even now, if you want to play on the old prog server, Fippy Darkpaw, (which I'm guessing almost no-one does any more) you still have to have a paid-up All Access account. Which, of course, I do - only not the right one. And so it goes... After sixteen years of chopping and changing, from illegal account sharing, borrowing and taking over each other's discarded characters, to server merges and payment model rationalizations and being sold off like chattels - twice - our SOE/Daybreak accounts are a hideous tangled mess, almost as much so as that paragraph above. It's something that is not going to get any better. Ever. So I just live with it. Anyway, remind me; why am I playing on Ragefire, again? It can't be to get a nostalgia fix. 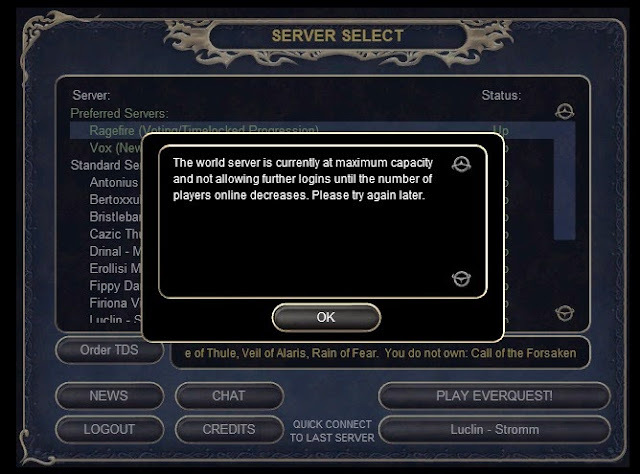 I never stopped playing EQ. It's still a current experience for me and you can't be nostalgic about something you never stopped doing, can you? And don't I have a whole raft of characters I'm - verrrrry slowwwly - working on, any of whom would be a better investment of the limited time I can find to spend in the elder game than a fifth necro? And besides, the version of Norrath currently showing on Ragefire would surely make for a very poor nostalgia trip for anyone, wouldn't it? There's so much that just isn't even the tiniest bit like it was in The Good Old Golden Olden Days. 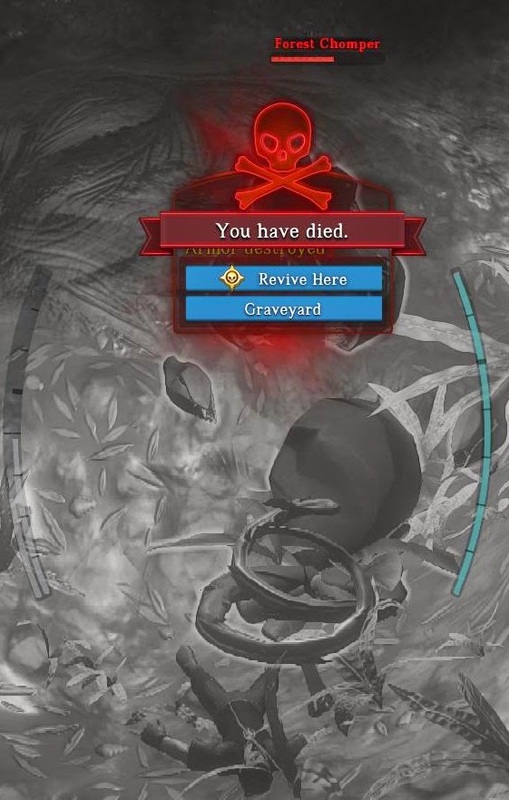 There are no real corpse runs because you keep all your gear on death. You can't even lose a level any more. Your pets zone with you and don't explode with a cry of anguish and despair when you thoughtlessly turn yourself invisible. Your spells scribe instantly. Come to that, the entire research system is different. When you arrive at a new city on a different continent there's no need to spam /ooc and /shout, increasingly desperately, "Looking for Bind at Gate", terrified that at any second someone could pull a train over your hiding place and send you back to your bind spot two hours travel away. Nowadays, in our Brave New Classic World, you just stroll up to the Soulbinder NPC and presto, safe. There are a thousand ways the current version of "Classic" is nothing of the kind. I haven't played on the now officially sanctioned Project 1999 but I'm pretty sure that if you want anything that even begins to approximate the genuine Everquest experience that's where you have to go - and I bet even there it's a damn sight easier than it was in the one and only original 1999. Thing is this: you can't turn back the MMORPG clock. Wish you could but you can't. 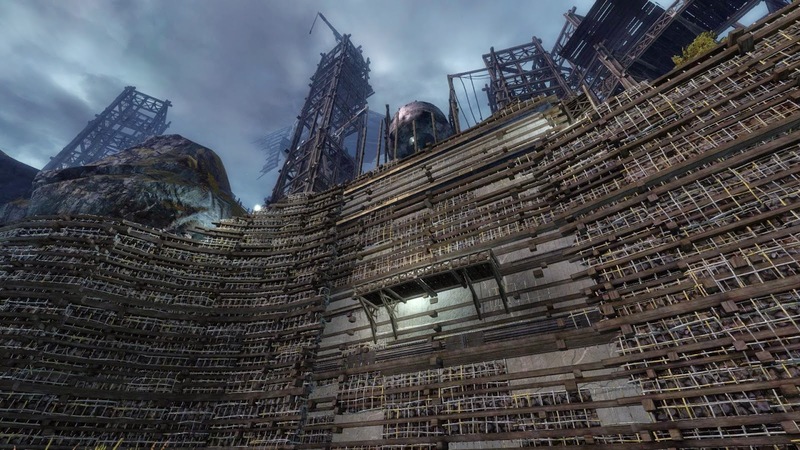 Unlike static, offline games that genuinely never change, online games are living constructs. Their very essence is change. How can you hope to re-create the Classic Everquest experience when the game was patching in changes almost from the day it launched? Have you ever read the patch notes for EQ from the first few years? Allakhazam has the full record archived for posterity. It's fascinating reading. The game changed, substantively, month by month, sometimes almost week by week and it never stopped changing. The EQ we were playing right before Kunark was already a very far cry indeed from the EQ that had launched just a year earlier and yet somehow we're supposed to lump it all together and call it "Classic". Over in WoW, the game that snatched Everquest's ball, ran away with it and never gave it back, Blizzard will have no truck with Classic servers and programmed nostalgia. So they say. Yet they still seem to believe they can turn back time. To the dismay of many and the delight of, I would guess, very few, this week Blizzard announced that all flights over Draenor and any future New Lands have been cancelled - for good. Well, you can make a player a walker but you can't make him think it's for his own good. Grounding the mounts won't be taken as a joyful return to a golden age of exploration and mystery, just a bloody nuisance. As Pike's perfectly chosen quote from Leonardo da Vinci puts it "Once you have tasted flight, you will forever walk the earth with your eyes turned skyward, for there you have been, and there you will always long to return." Meanwhile I'll be out there today with the rest of the would-be time-travelers, trotting across the Steamfont Mountains with my bony pet, hunting down decaying skeletons for bone chips and kobold runts for cloth pants. It took me an hour to hit Level 2 last night so some things haven't changed. Oh, and as to why I'm playing on Ragefire? I've remembered. Forget the ruleset - it's got that New Server Smell. Can't ever get enough of that. It must be a strange job, working in ArenaNet's art department. You get to put your heart and soul into creating stunning visuals that will be seen and admired by millions of people, knowing all the while that sometime, probably sooner rather than later, out will come the metaphorical Eraser of Progress and all your work will be consigned to oblivion. At least whoever worked on the Lion's Arch update that arrived out of the blue in yesterday's patch knew they were working on something that wouldn't be around for very long. After what seems like months...oh, wait, it is months... of pointless clattering and hammering suddenly, overnight, most of the rubble and detritus from Scarlet's Reign Of Terror has vanished. Replacing it we have vast walls of scaffolding, huge barges of sand and even airships acting as skyhooks. 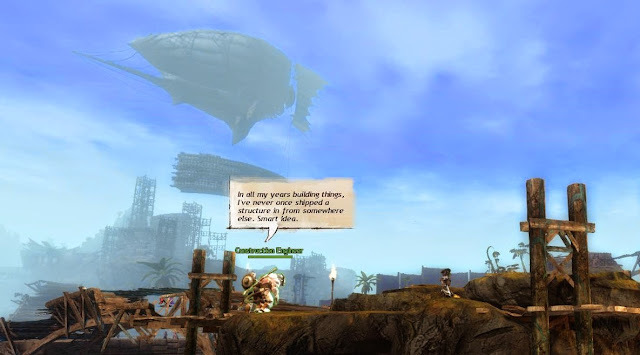 Instead of inept and aimless hammerers there are confident, professional teams of architects and civil engineers, setting up theodolites while their asuran-manufactured golems busily ping asuran-manufactured receptors to measure...something. Post-patch I eschewed combat in The Mists for once. It was hard to take the eternal battle seriously as an epidemic of bugs saw World Peace break out among players, who all found themselves on the same team, reduced to forming tripartite zergs 150-strong to hunt the Overgrown Grub, just to have something to do. Instead I took a tour of the building site that one day will be Our New Home. The unfortunate Artist's Impressions released by ANet on the website yesterday, showing what we can expect when the work is complete, suggest Lion's Arch is going to be re-modeled as some kind of cross between a Las Vegas Casino and a Gulf State Shopping Mall. Huge swathes of land have been cleared already. 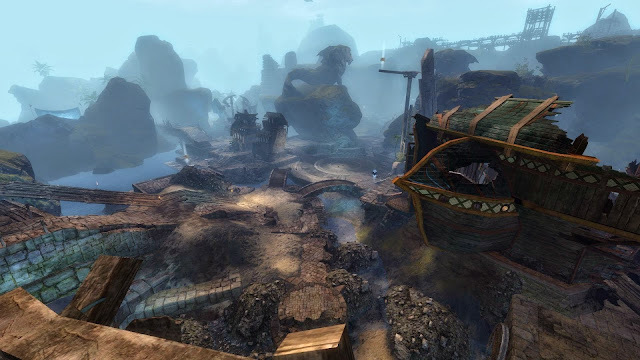 I'm taking it that everything gone won't be coming back, which includes virtually every pirate-themed aspect of the last incarnation other than the hulls that used to hold the Bank and the Black Lion Traders. It appears the Age of the Pirate is over. The New (New) LA will be a fortified city, something which makes all the claims that it's going to be prefabricated elsewhere and then flown (or possibly ported) in overnight all the more impressive. That has to be millions of tons of masonry they're talking about. I have to ask, if The Ship's Council (or The Pact or The Consortium or whoever the heck is behind all this) has the capacity to move that much rock that fast, why don't they just drop the whole lot on Mordremoth and save us the trouble of going to the Heart of Maguuma at all? On the other hand, when you look at the angle of the new lighthouse, which is supposedly now complete and ready to begin operation, you have to wonder if they have Clue One about any of this. It looks almost as bad as the old one after the Karka finished with it. That, by the way, has now been completely dismantled. There's nothing left but the rock on which it used to stand. At least now we can get around town without falling through unfinished bridges or into holes. The jagged shards of Scarlet's machine have been pulled from the walls and the bitter memory of her near-triumph along with them. The refugees seem to have moved on too - or been moved on. Even the camp outside Vigil Keep seems emptier than I remember it, although there are still a few lingerers there, perhaps too traumatized ever to return. Lion's Arch, between two states as it is, feels oddly serene. There's an unaccustomed sense of space and freedom. The views by night are superb. It's worth the trip just to see them. And enjoy it while you can because it won't be around for long. Although, honestly, when it's Lion's Arch you're talking about, when was it ever? When it comes to giving tips to each year's new NBI intake it's often a struggle to think of anything that hasn't already been covered, not least by yourself, last year and the year before that. Of course, since the target audience is supposedly people new to blogging you might feel safe in assuming they haven't read your words of wisdom from previous years and it certainly won't do any harm to dust them off, make a few corrections and additions and offer them up again. Murf did that with his excellent and entertaining piece on grammar and sentence structure. In linking to Murf, like I just did, I was offering a practical demonstration of one of Aywren's Tips for Connecting to the Blogging Community, namely "if you read a blog post that inspires you to respond with your own post on the same topic, link to that original post or to other posts on a similar topic". That's great advice. You can even go a stage further and do a whole post made up entirely of links. It's a public service other bloggers will appreciate, both as readers and when you link to them and send them traffic. At any given time there will always be someone performing this welcome and often under-appreciated role. Tipa used to do it, then Spinks. Currently J3w3l has taken it on and is doing sterling service despite Wordpress's best efforts to thwart her. One thing most regular readers of blogs will come to notice after a while is that trends and topics move through the blogosphere like waves rolling onto a beach. Sometimes the wave begins far out to sea, on some blog you don't follow or in an interview with a dev for some game you never played, other times it surges up unexpectedly right in front of you in your rss feed. Wherever the wave begins, before long all your blogroll boats are bobbing. It's an easy in to a day's posting to ride that wave and bob along with the rest. If you watch the waves closely, though, you may see the hidden rhythm of the tide as separate waves roll back, under and across one another, gaining or losing strength as they absorb each other or dissipate. Topics, trends and themes throughout the blogosphere tend to demonstrate both synchronicity and synergy, which isn't surprising when you consider we are all reacting to subsets of the same stimuli. Right now, there's a clearly-defined boost to the effect, caused by the multiple NBI Talkback Challenges and Screenshot Safaris. Often, though, it can seem almost magical. There's little in blogging more satisfying, to me at least, than the sensation that you're making connections between ideas as they hum and spit across the zeitgeist, the feeling you get when the architectonics of a post that will weave them all together begin to coalesce. On a good day it feels like bottling lightning. The words tumble from the keys almost faster than your fingers can follow. Other times it's plain hard work. Sometimes those ideas that seemed so lucid and transcendental in the mind struggle against codification. They need to be wrestled down onto the page, where they lie inert; defeated and flat. And sometimes what comes out seems to have no connection to what went in. You look at what you've written with confusion and surprise. This post is one of those. 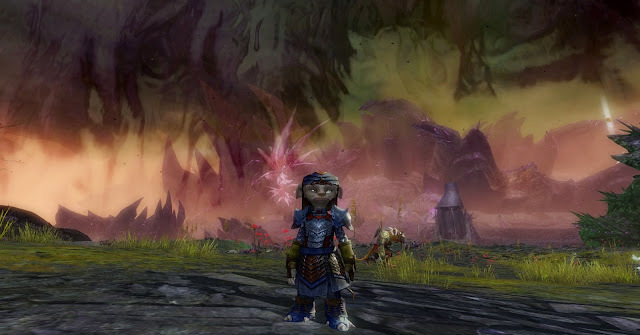 I sat down to write about Exploration in MMOs, bringing in the "What Made You A Gamer?" NBI Talkback Challenge and the whole repeatable content furore instigated by the WoW Dev Shoots Self In Foot interview. I was going to weave such a tapestry out of threads suggested by Gaming SF, Kill Ten Rats, Tobold, In An Age, The Rykter Scale and more. I had screenshots ready from GW2 and Dragon Nest Oracle, where I was going to use the patina of lichen on the red roof tiles and the angle of the wooden shutters on the windows to illustrate the ineffable nature of both compulsion and delight. So here's my NBI Blogger Tip for 2015: when the post you write turns out to be different to the post you thought you were going to write - just go with it. You can always write that other post another day. Although the chances are you won't. The waves are never still. Today my cat and I went walking. It was another lovely day. The sun was warm. The water cool. We sat together for a while. After, as we walked on, he said, "Everything is so beautiful. Why must we fight the dragons? Why can't we just play and fish and sleep in the sun?". "Oh, Charlie", I said, "You are such a cat!" And then I took him to The Brand. When it comes to combat in MMORPGs, given a choice, I'll always go for the traditional. I like my hotbars and most especially I like to have full and complete control over my mouse pointer at all times. I'm a clicker and proud of it. For a few years now, though, sentiment among MMORPG developers has been set dead against old fuddy-duddies like me. Industry wisdom has it that conventions like hotbar combat, tab targeting and even WASD movement have been acting as a drag anchor on the genre's chance of a breakout. To remain a purist would have been to close the door on any number of hybrid MMO/MMORPG/ARPGs and my curiosity would never allow that. The first time I wrestled with the new controls was in the DCUO beta back in late 2011.Was it really only three and a half years ago? It feels like a decade must have passed at least since then. Then there was the original Dragon Nest, Neverwinter Online, TESO, half an hour of Tera and now Dragon Nest Oracle and Landmark. Most likely several I've forgotten about as well. Don't mess with me. I know Origami. It's not a massive sample but it's certainly enough for me to appreciate that it's not a simple case of hotbars good, mouseclicks bad. Yes, my preference is always going to bias towards the classic Everquest select-execute-observe style of combat but I do recognize that feeling comfortable and in control with no mouse pointer on screen is not an absolute impossibility. Yesterday I spent around an hour exploring a little of the first underground level in Landmark. For a good while I had the dark, twisty caves to myself but eventually I fell down some kind of fissure and found myself in a cavern where monsters dwell. Four kinds of monster to be precise - Chompers, Wisps, Slaugs and Abominations. That's the entire bestiary so far. Oh, and there's a Mushroom that explodes, if you count that, which I don't. All of the above were lurking or hovering or slithering around in the large, dark, cavernous space and over the course of half an hour or so I killed at least one of every kind. Why do I get the feeling the tide just went out? It wasn't easy. I'm not entirely sure it was fun. It was certainly inelegant and awkward. All I had was the standard-issue newbie sword with its two basic attacks linked to right and left mouse. Since the RMB attack is a leap I didn't use that much. Positioning was difficult enough already. Progression in Landmark, such as it is, rides on Achievements. Many of the things you'd naturally choose to do turn out to have rewards attached via this system. The very first monster you kill rewards a Pulverizer, a handy device that allows you to tunnel quickly through rock. I wanted one of those so when a wisp started to zap me instead of panicking and trying to run away I whacked it with my sword. Okay, that was just a practice round. I won the first fight to my considerable surprise. And the second. And the third. I had my Pulverizer but now I also had another Achievement in sight, the one for killing ten monsters in the first level of the underworld. Some of the fights were close but I only died once, to my first Chomper, a notoriously awkward customer at close quarters. I got him on the rematch though. My impression of the combat was "it's not completely awful". As a very - very - basic template it has possibilities. Like just about every aspect of Landmark right now it feels like something that might be ready for commercial release with, oh, no more than another couple of years work. Still, I can now at least imagine playing a character in EQNext using some much more polished version. Whether I'd enjoy it is harder to say. If I don't, though, it will not be because of any innate and immovable prejudice against the type of combat they've chosen to go with. 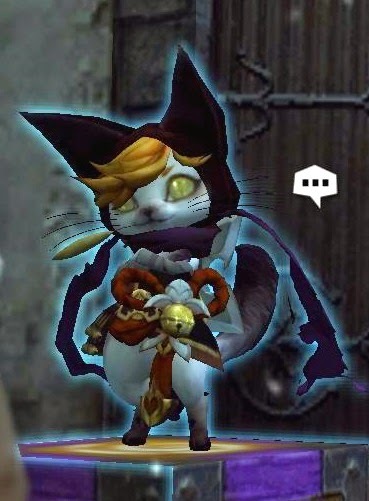 Dragon Nest Oracle went for exactly the same center-screen cursor targeting, LMB/RMB attacks system, only there it is a sheer joy to use. Granted my diminutive protagonist is using the left mouse button to fire a hand-cannon the size of a pygmy hippopotamus and that's what does most of the damage but it's not all range range range. She's also got a six-foot spanner she swings with the right to knock things down! I don't have any shots of DNO combat. The differences are manifold. Above everything there's the responsiveness. My character in DNO looks and feels solid with a physicality that most MMOs lack. The animations all match perfectly to the actions I'm taking and the impacts feel concussive and reactive. It's a real ARPG so everything is speeded up, something I wouldn't expect or want in Landmark or EQN, but if a fumbling amateur like me can operate the controls comfortably at those speeds then surely a more stately pace should be even more to my taste. Dragon Nest Oracle also has a lot of explosions. I really like my explosions. 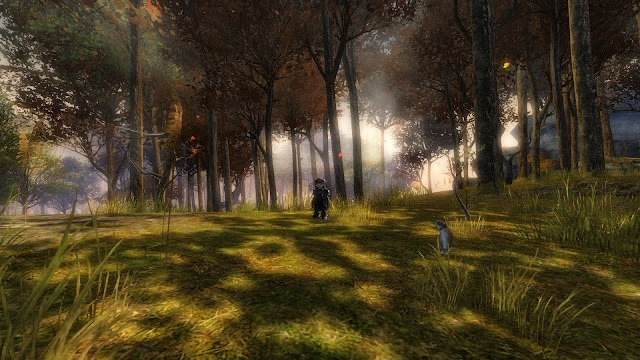 Often you can't see what your fighting in GW2 for the particle effects, which I have on maximum at all times. I'd rather see a firework show than an ogre's face any day. It might surprise people who haven't played but original Everquest also has particle effects that can be cranked up until there's little on screen but swathes of neon color and enough sparkles to keep a unicorn factory running for a year. I used to play with those on full, too, except when I was main-healing. 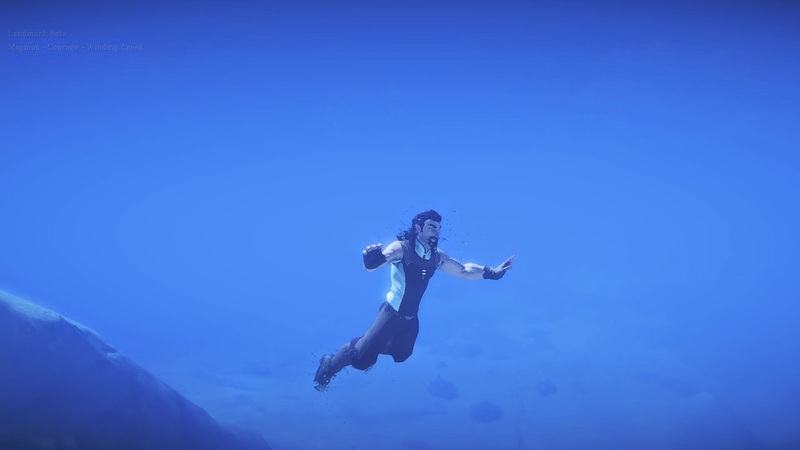 If Landmark has anything in the way of spectacular visual effects during combat I missed them. That might be because it is pitch dark in those caves and apart from the wisps the monsters are hard to see, although darkness is a bit of a thing for Daybreak at the moment, so maybe that will change. It's also likely my very basic starter weapon has no attached special effects. You don't really get particle effects with a rusty sword. Just tetanus. I'm really not sure about having a forge inside my house. I didn't have much time to worry about the candlepower in my Lightstone anyway. (I made it myself, you know). I was mostly concentrating on keeping the monsters in the center of the utterly ludicrous calipers that Daybreak are using as a "cursor". It was quite a while before I noticed that as well as bracketing the target those giant parentheses also show you the state of your armor and health. An uglier, more intrusive and, well, plain daft way of doing so would be hard to imagine. That really has to go. Despite the very major limitations and shortcomings of both Landmark's combat system and my natural ability to operate it I emerged from the underworld feeling oddly pleased with myself. A click of my Stone of Recall took me back to my tower, baking in glorious sunshine beside the ever-rolling waves, where I made immediately for the Forge. In the course of my battles I'd managed to loot enough Ether Shards to make myself a better weapon. I went for the bow which, under Landmarks' latest, highly streamlined crafting system, you do indeed make in a forge. The farther back I can stand when I'm fighting something that can rip my head off the better I like it. I think I might pop into Not-Norrath and have a go with it right now. 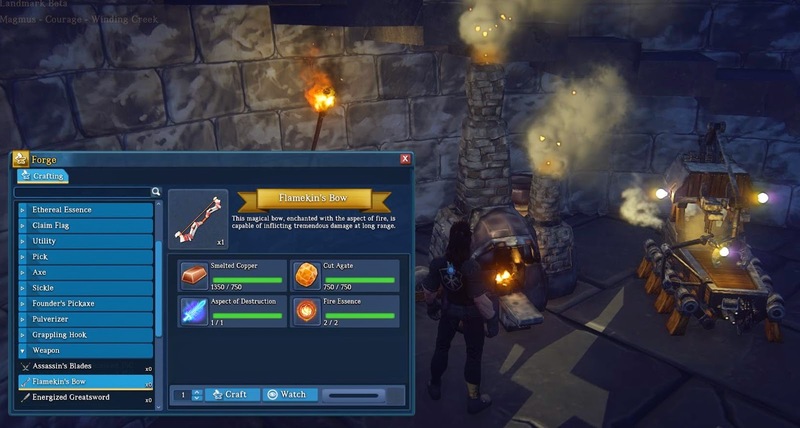 It was around fifteen months ago that those of us willing to stump up real money for the opportunity got our first hands-on experience with Landmark. 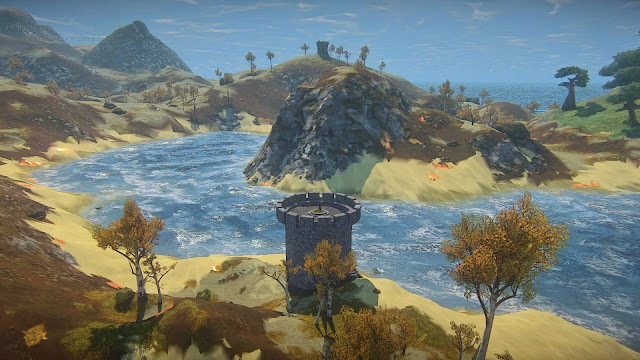 Back then it still went by its full, unwieldy and, as it turned out, misleading title: EverQuest Next: Landmark. The new world. It's busy but I still had no trouble finding a really gorgeous waterfront lot. 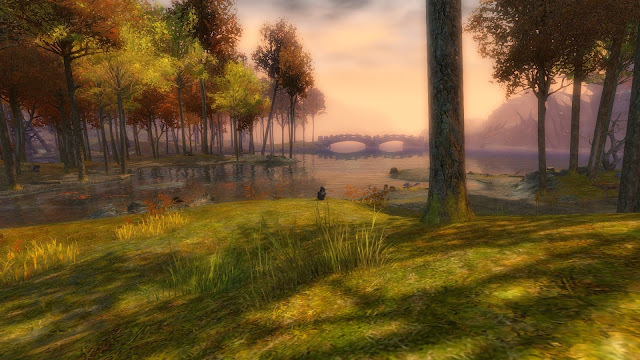 In what must have been the marketing department's dream and the design team's nightmare, all the news was about the numbers: would-be homemakers wandered the beautiful new lands that might or might not be Norrath, looking for somewhere, anywhere to stake a claim. New servers opened in clusters just to accommodate the exceptional demand. It was the kind of publicity money can't buy and best of all SOE didn't have to: their players were the ones paying for it. The NDA was dropped, stunning screenshots and breathless excitement splurged across the interwebs and all was right in the land of SOE for a while. Oh, there were a few people, the kind who don't even read the large print below the headlines let alone the small print in the terms and conditions, who complained that they thought they'd bought, y'know, a game and, like, where was it? There were even a few who imagined they'd bought EQNext. It is to laugh. Those people all got refunds if they asked, though, so it was all good. The naysayers left and the rest of us got on with digging and building and generally having just a whale of a good old time. 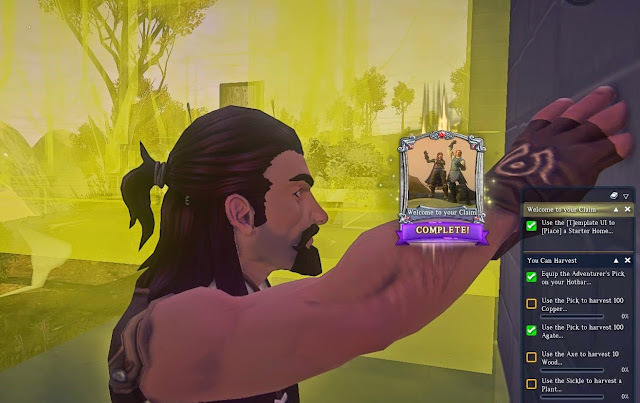 Only as the weeks turned into months and alpha turned into closed beta some of us began to wonder if those pleasure-deniers might not have had a point after all. Where was the game, indeed? The servers emptied out. Upkeep went unpaid, claims vanished, much of the tamed land went back to nature. Mentions in gaming news and across the blogosphere grew thin. SOE's interests seemed to have moved on to zombie survival sandboxes and elsewhere. Then one day there wasn't even an SOE any more. Other than Massively OP's ultra-loyalist M.J. Guthrie, who even remembered Landmark was still there? And then, last week, it all started up again. Well, kind of. Landmark die-hards have long been expecting, craving even, their own Year Zero and it's finally arrived. 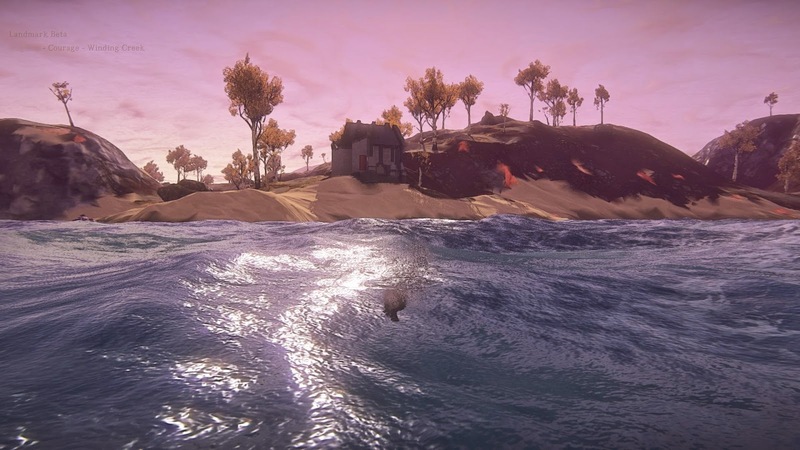 There was a complete claim and character wipe, the servers came down for a couple of days and when they came back up everything had changed, from the number of servers (down to four) to the names and geography of the islands. It's quite literally a whole new world. 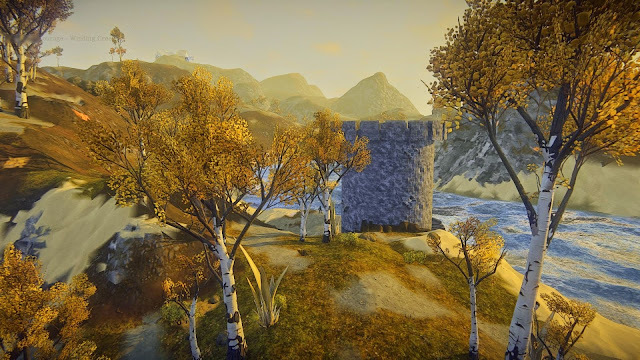 I wasn't one of those who'd forgotten about Landmark entirely. I've been paying distracted and sporadic attention, visiting the forums now and then, reading the very occasional news squib, wondering idly whether to patch the thing up and log in but always finding some reason to do something else instead. It didn't help that a while back Landmark started to run like a drunken pig on my five-year old PC, making even moving from one place to another feel onerous and tiring. I hope my neighbors aren't pirates. Even though I hadn't forgotten about Landmark I probably wouldn't have taken the trouble to make a new character and start over again from scratch right now had it not been for the enthusiasm of those who just did. Kaozz, who has a machine that can run the thing properly, posted some stunning screenshots. 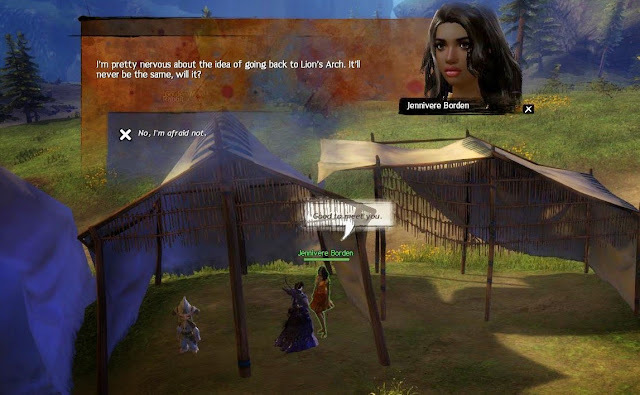 Aywren gave a great account of the way the whole experience has changed. MJ at MassivelyOP, for once, came over as the negative Nelly (her words!) and yet even her reservations made the game sound more interesting than it had for a long, long while. You can just make me out in the middle there, doing a rather fine Australian Crawl. "Overall, I feel this patch has made Landmark much more accessible to the general player". About the only thing she forgot to mention was how fantastic the swimming is! Come on in! The water's fine. In fact it's the best I've ever seen. But don't run away with the idea this is job done for Daybreak Games. They still have a lot of work to do. 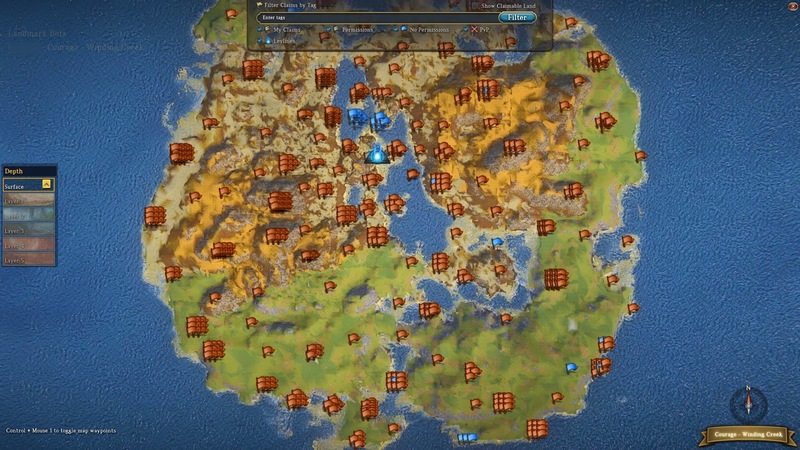 As longtimers have said on the forums, Landmark isn't even ready for Open Beta yet. It does, however, at least feel like a real Closed Beta for something that might turn into an entertaining and worthwhile MMO some day. We're not in alpha any more, which for most of the year-long supposed "closed beta" until now, we might just as well have been. Zubon has thought-provoking piece up about the difference between compelling and entertaining content. I have always found Landmark compelling - that voxel building is like virtual crack - but I was never sure whether I found it entertaining. 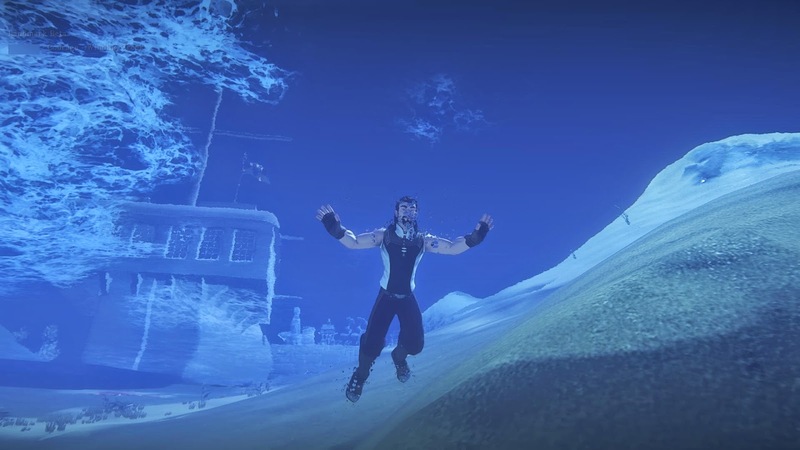 It's often been hard to tell whether I've been spending time profitably in Landmark or just wasting it. The jury is still out on that one but the evidence is looking a lot more stacked in favor of a positive verdict than ever before. I'm going to need a lot of planks. Maybe I should just get a rubber horsie. Best of all the three hours I spent there last night made me feel optimistic for EQNext all over again. 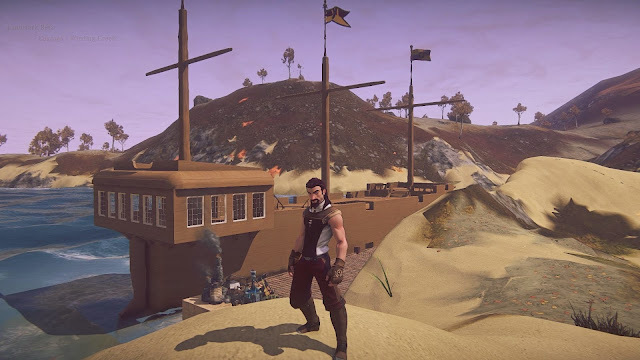 Landmark offers a useable interface, a non-alienating approach, a manageable hybrid between traditional MMO gameplay and console-friendly action gaming. I'll have to buy a new PC to run it properly but by the time EQN arrives I'm going to need one anyway. And now, if you'll pardon me, I have a jetty I want to be getting on with. Can't really have a lakeside home without one, can you? Blue Skies Ahead For Daybreak Games?